By turning off their non-essential lighting for one hour—Earth Hour— Americans will join millions of people around the world in their commitment to fight climate change and send a message to elected officials that the time to act is now. 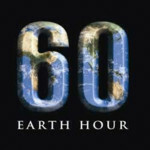 Ultimately, Earth Hour 2010 seeks to raise awareness about climate change and encourage the U.S. Senate to pass legislation and ratify an international treaty that reduces CO2 emissions. With every flick of a light switch, a vote is cast for lasting action on the escalating climate crisis. On March 27th at 8:30 p.m. local time, Earth Hour will cascade around the globe—from time zone to time zone—uniting the planet under a single, simple, call to action. Since its inception by World Wildlife Fund three years ago, Earth Hour’s non-partisan approach captured the world’s imagination and became a global phenomenon. Nearly one billion people turned out for Earth Hour 2009 – involving 4,100 cities in 87 countries on seven continents. Register today to show your support at My Earth Hour!